Summer Sailing Camps are posted! Summer Sailing Camps are posted, Give the Gift of Sailing in 2018! 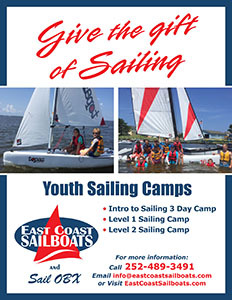 East Coast Sailboats has been teaching sailing on the Outer Banks since 2012. Our experienced and professional staff of Instructors, excellent fleet of sailboats, superior locations, warm shallow waters and steady breezes make sailing on the Currituck sound the best location on the Outer Banks. Whether it is a First Sail, Private lesson or Summer Sailing camp, we will be able to tailor sailing instruction individually or as a group. The goal is to provide an exciting and fun experience. During which students develop sailing skills, learn seamanship, water safety, gain self-confidence and most importantly have fun!! 2018 Gift Certificates Available- CLICK HERE.